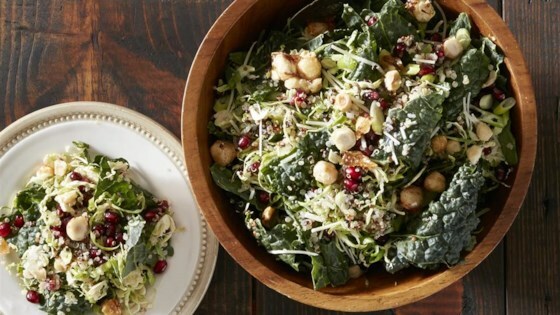 "This healthy, hearty slaw from Sara Forte of A Sprouted Kitchen is a delicious addition to your holiday menu." In a food processor, combine the shallots, vinegar, lemon juice, maple syrup, olive oil, salt and pepper and blend until smooth. Set aside. Line a small baking sheet with Reynolds Wrap® Aluminum Foil. Set aside. In a non-stick pan over medium heat, combine the hazelnuts, sugar and cayenne. Stir with a silicone spatula until the sugar has melted and sticks to the nuts, about 5 minutes; turn down the heat to prevent burning if needed. Spread the sticky nuts out on the foil-lined sheet to cool. When the nuts are cool enough to handle, break them up by hand. Stem the kale and chop well. Using a mandoline, shred the Brussels sprouts, discarding the tough ends. Combine both in a large salad bowl. Add the hazelnuts, quinoa, pomegranate seeds, green onions and cheese. Dress to your liking and serve immediately. For nuts that easily go from pan to plate, line your baking sheets with Reynolds Wrap® Aluminum Foil.